The project included an evaluation of Building #110, a two story brick building that was originally built in the 1840s as a stable overlooking the southern tip of Manhattan. It became known as the "Town Hall" because the building housed all of the administrative offices that had jurisdiction over the Island. The work included identification of the current departments located in the building, identification of their existing space needs, and a projection of future space needs. A series of space planning options were explored, along with associated construction and operating costs, and a ranking matrix was developed to evaluate the schemes. The selected soultion was to replace the existing antiquated building with a new three story building, with parking below the offices. 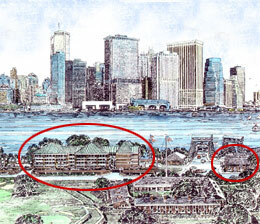 The project involved the adaptive reuse and renovation of Building #109, and WWI warehouse building, that was located adjacent to the ferry slips at the main public entrance to the Island. The work included the design of interior renovations, the exterior restoration of the building, the layout of exhibits, and construction documents.